Android cleaning apps have been there at the Play Store from the start. However, the android phone cleaner apps were not as accurate as they are now. Also, the developers engaged with junk cleaner applications tried deceiving the users back then (some still do!). Now, you would observe a ton of junk cleaner applications available. But, do they all work? What do they clean exactly? Junk files? What are they? In this article, we will get to know the answers to all of these questions followed by the list of best junk android phone cleaner apps that you can have installed. 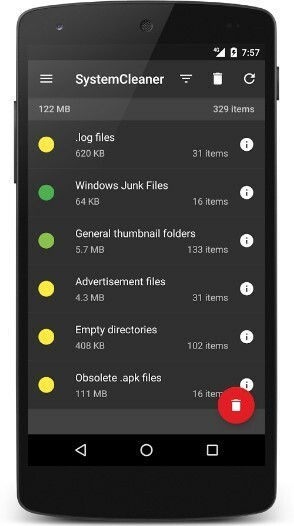 What Are Considered To Be Junk Files on Android? Do I Have To Be Careful While Deleting Junk Files? Do Android Cleaner Apps Speed Up Your Android Phone? Many things are to be considered when we talk about “Junk Files.” Which of the files do you think are important to you? Which of them are useless? If a file is not useful to you, it might be helpful for another user. It depends on how you treat – “Junk” – to your usage. For instance, the WhatsApp media folder (which contains the photos, videos & audios shared through or received on WhatsApp) might act as a junk file for some and important data for others. Although, we do have some common category of junk files that everyone wants to get rid of. It includes – thumbnail cache, temporary files, residual files, obsolete APKs, app’s cached data, and so on. Yes, you do have to careful while sweeping the junk files. If you are doing it manually, you already know what is needed and what is not. 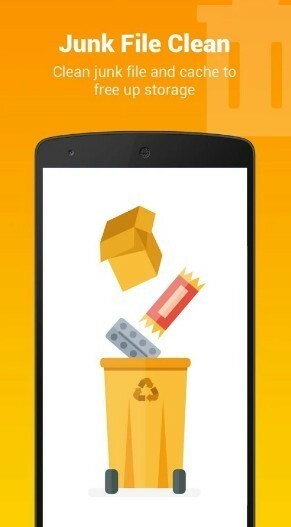 However, when considering the junk cleaner apps for Android, you need to review the files before deleting it. Well, it is nice to automate tasks, but you need to review the files often to be sure of the cleaner’s reliability and accuracy. 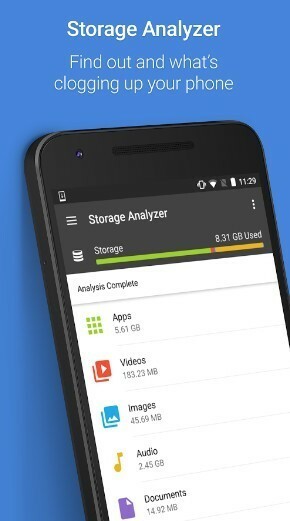 You may also observe that some of the cleaner apps for Android target large video files as junk files and would suggest you to proceed cleaning them. So, make sure you have reviewed the video files before cleaning them. Yes, they do. The difference may not be comparable for every user. But, it surely makes a difference. While you know that cached data helps load things faster but too much of it leads to performance issues. So, in that case, cleaning the cache files would give your device a boost. In that way, the android phone cleaner apps help speeding up your device. Clean Master is one of the best android phone cleaner apps available at the Play Store.It offers a good user interface which is easy-to-use and looks good at the same time. 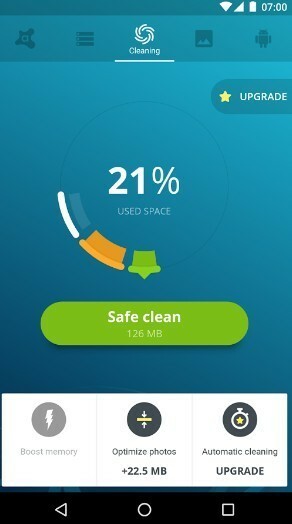 Clean Master detects almost every bit of data that needs to be scrapped off your device to free up space. You will observe two modes available to clean junk files – default and a deep cleaning mode. The default mode is always in effect and has no manual triggers. But as the scan completes utilizing the default mode of operation, it asks whether you would want to free up more space, and that is where deep cleaning mode comes to action. The deep cleaning mode generally targets the large files and folders which you might have missed cleaning and have been there on your device for a long time. DU Speed Booster & Cleaner comes next to our mind when talking about some of the best Android cleaning apps. It brings in a lot of useful tools along with the junk cleaning capabilities. If you are someone who utilizes a different app manager, an app lock, a network booster, and a security app, then you may keep DU Speed Booster as a replacement for all those individual applications. With DU Speed Booster, you get to clean residual files, obsolete APKs, Ad Junk files, cached data and so on. Also, you get a DU Swipe feature which lets you quickly navigate to your favorite apps by swiping across the corner of the screen. CCleaner is yet another awesome junk cleaner app for Android. It is one of the only android phone cleaner apps which focuses on junk cleaning and freeing up storage space. Unlike the first two, CCleaner does not offer all-in-one tools. 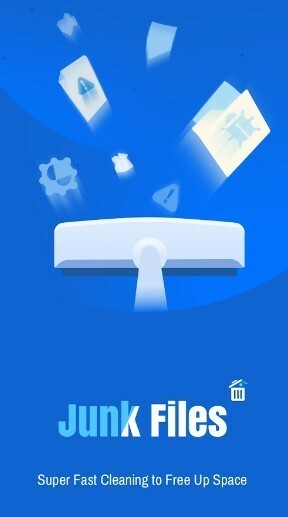 But, it still makes its way to work as one the best junk cleaner apps for Android. It offers a subtle way to manage the RAM and reclaim your storage space by deleting the junk files. If you were looking for an ad-free junk cleaner, this could become one of your favorites! 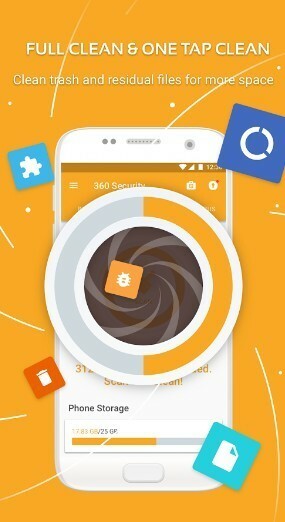 360 security aims at giving a sense of complete security on Android. The user interface is surely impressive. 360 security does offer a lot of features. 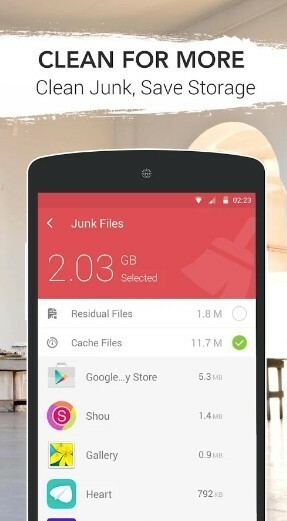 You can clean the junk files (residual files, app caches, and so on) in a single tap. Also, you get to scan your device for adware, malware, viruses, and other threats. As a bonus, it also offers an Anti-theft feature. So, cleaning junk files while keeping the device safe – is the future? Why not have a try? GO Speed is yet another incredible android phone cleaner app. It has been developed by the very popular GO Dev team. If you were looking for a compact application without unnecessary features but just focusing on junk cleaning, GO Speed is the one to go for. Just for the sake of security, it does offer an AppLock feature. But, apart from that, it solely is meant for Android junk cleaning. The user interface is unquestionably good, and the application does detect the junk files as expected. Looking for a pure junk cleaner? No AppLock feature? No battery saver? Just plain and simple junk cleaner? If that is the case, Avast should be the one to have installed on your device. You can utilize Avast Cleanup & Boost app to clear the junk files and give a boost to your Android system. However, Avast does offer a premium subscription where you get the ability to clean the junk files regularly automatically. Also, you get rid of the advertisements with the premium subscription. 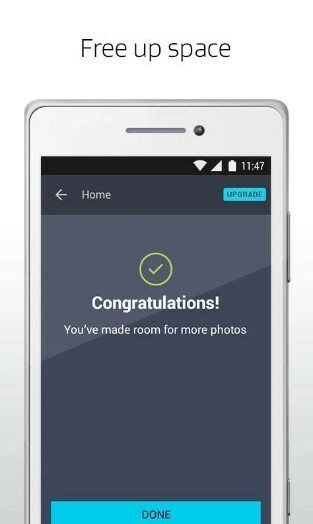 AVG Cleaner is a brilliant app by AVG Mobile to help you remove the junk from your Android device. 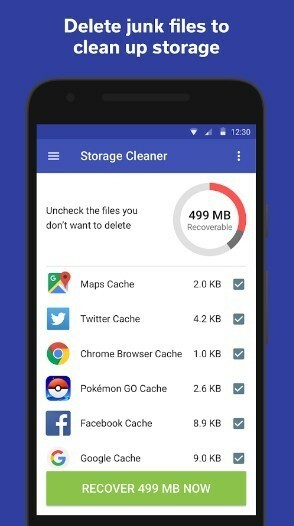 Similar to other applications available, it lets you clean junk and cache files to reclaim your storage space. As a bonus, it detects duplicate pictures as well and asks you whether if you want to delete them to free up space on Android. You can set customization reminders to regularly clean up your device and keep it running smooth. On a weekly basis, you would be reminded of the apps that you rarely use. You can go ahead and delete them if you are really not using it anymore. AVG Cleaner also gives you the ability to save more data by suggesting to uninstall the apps that consume a lot of your data. A one-stop solution to optimize the device and extend the battery life. It kills all of your background processes to give your device a boost and pausing the resource intensive applications saves your battery juice. Battery profiles could help you automate the things but would require in-app purchases, as it is available for a 30-days trial only. Turbo Cleaner is a compact android phone cleaner app. Unlike some of the others, it does not bring in additional tools like AppLock, App Manager, and so on. It is focused on a single task i.e., cleaning junk files and cache to speed up the device and claim unused storage space as well. You can also watch for the apps that demand more resources to become the cause for heating issues on your device and then clear it with Turbo Cleaner. Similar to the popular ones, you get the one-tap boost option right at the homescreen to make things easier to manage while keeping your device fast. It surely is one of the best Android cleaner apps. The Cleaner is unquestionably one of the best looking android phone cleaner apps. It provides an excellent user interface. You get a complete package of things that include app manager, game booster, app locker, memory optimizer, and so on. Of course, it lets you clean junk files and cache. It also detects the obsolete APK files residing when cleaned up would free up space on your Android device. Also, you can set scheduled reminders to clean the junk files and cache to help keep your device run smooth. 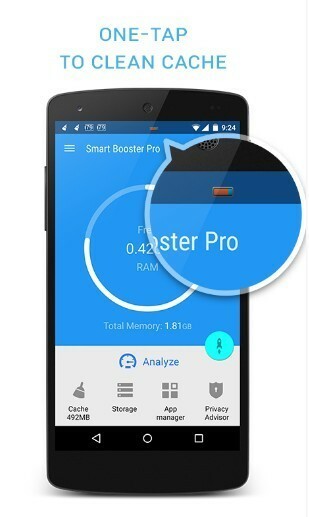 The Game Booster and memory optimizer feature make it also one of the best android booster apps available at the Play Store. 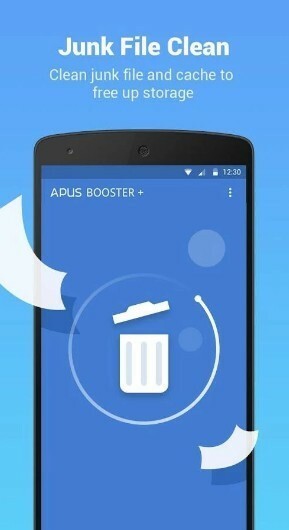 APUS Booster+ is yet another compact android phone cleaner app. It features the one-tap boost option. APUS Booster+ isn’t just a booster app for Android but also helps cleaning the junk files, residual files, and cache to reclaim storage space. You can utilize it as an app locker as well, precisely, an all-in-one app to have installed. Smart Booster is already one of the best Android Booster apps which let you clear RAM and also set a time limit or threshold for when to clear the RAM to keep things faster. 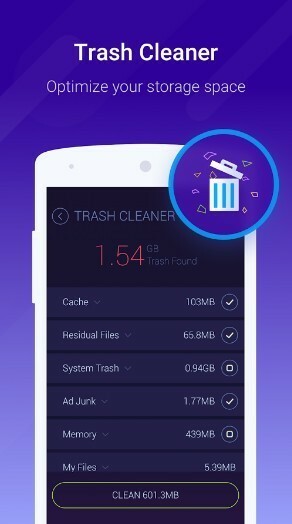 Popularly known as Smart RAM Booster, it recently introduced junk file cleaning functionality and also the ability to remove cache files to help you free up space on Android. Moreover, you can clean the cache with a single tap anytime utilizing the overlay widget. It lets you enable an overlay widget which would help you boost the device no matter what app you’re currently on. When you run out of storage, it’ll notify you to clean things up. Overall, it is a compact android phone cleaner app which advanced options to boost your device by clearing the RAM. An all-in-one tool that includes cleaning capability could be the perfect one for you. However, to some, having a lot of tools that they do not use may not be a good solution. So, All-in-One Toolbox is only for the one who is looking for a great set of tools along with the functionality of cleaning in a single app. It comes baked in with app manager, memory optimizer, battery optimizer, file manager, mini launcher, and a privacy guard. SD Maid is a great alternative to other android phone cleaner apps mentioned above. The app offers a great user interface along with the perfect tools to help keep your device tidy! With the free version installed, you can simply get rid of the residual files and junk files. To be able to remove applications and optimize the databases, you need the SD Maid Pro, which costs you under a dollar (21 INR). We’ll recommend you to have a rooted device to make the most out of it. However, we do not encourage rooting your device. So, now we know of the best cleaner apps for Android. Some of the applications mentioned are tailored to act as an Android cleaning app only while the others come baked in with additional useful features. Which of the cleaner apps for Android do you like? Did we miss any of your favorites? Do you utilize a cleaning app for Android? If not, you could share what you think about the android phone cleaner apps in the comments below. What Is A 7z File? How To Open 7z Files? I have read many articles stating that you don’t need cleaning apps. Your smart phone has that built in. Its all in the settings. While this holds true when you do not want additional apps. However, these cleaning apps do help you clean the junk files (logs), obsolete APK files, and detects large files as well (suggests you get rid of them if you do not want it). In a nutshell, these apps pretty much help you automate the process than requiring you to search for log files – clean them, then go to the settings to clear the cached data, browse the file manager to look for the files you do not want and also find the obsolete APK files lying around. That left tons of cashe after cleaning. Should always check before I post! ???? I appreciate your feedback. I won’t say that cleaning apps are perfect but it does make sense to someone who does not even know what “cached” data is and would never understand (avg consumers). However, I haven’t encountered a situation like you described with any of the cleaning apps mentioned. Also, let’s face it, you cannot escape cached data, it’ll always be there. But, a cleaner app does let you find large files, left overs, junk files quickly. So, there would always be trade-offs.